Swimming season is just around the corner. Pools are close to coming out of winter hibernation, when yours is read, there are some tips and tricks I will discuss in the coming weeks to help make the transition easier. The first thing to address is the winter cover. Whether you have an automatic cover, a spring tension cover, or a traditional tarp and water tubes cover it is going to need some cleaning and treatment. No matter what type of cover you have first remove any leaves or large debris using a combination of the pool brush and leaf net. In our area, the northwest USA, we experience heavy rain and snow during fall, winter, and early spring. This water collection on the cover, even with a cover pump in operation will cause the water level in the pool to drop. It is common to open a pool in the spring to a water level at or just below the skimmer. Add water to the pool until the level at or just above, 1-2 inches, normal operation. The extra water will allow a vacuum to waste, if your filter has the option, and still be at normal operating level. An auto cover is the easiest to clean from winter grime. Start by where it rolls up and coat the first few feet of the cover with the algaecide you typically use for maintenance. Then using your pool brush scrub the grime away and spray it forward using a hose and pressure nozzle. I do not recommend using a pressure washer! Slowly open the cover while moving the water and grime down the cover towards the opposite end. When a far amount of water collects pump it off using the cover pump. When you reach the end pump the remaining water out and the residue can be cleaned with a shop vac and some towels. A spring tension cover is usually mesh or has a mesh drain hole. Using algaecide and your pool brush scrub the grime and hose it to the drains to be vacuumed out of the pool later. Do not fully rinse the algaecide off the cover as it will help to keep mold and mildew from growing during summer storage . Remove the cover as directed by the manufacturer and store. A tarp and water tubes style is the most difficult to deal with. First I usually try to scrub as much grime away using algaecide and a pool brush, if you have access to a sump pump or cover pump, pump excess water off cover. 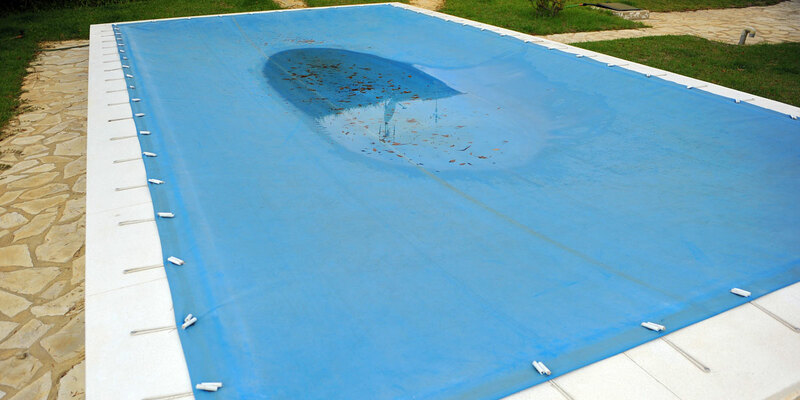 Uncover pool and fan fold cover as you remove it, the left over debris will get into the pool to vacuum later. Spraying a light coat of algaecide on the cover as you fold it will help prevent mold and mildew growth over the summer. Set aside to allow to dry and then store.